117 Admirals Row - Bldg. A - Beautiful Ocean View! Just 50 Feet from the Sand!! 117 Admirals Row - Our nicely decorated, two bedroom/two full bath villa is completely furnished for your comfort and enjoyment. It includes a queen-size bed in the master suite, twin beds in the second bedroom, and a sleeper sofa in the living room. The villa is 940 sq. feet and is most suited for a party up to 4 people. However, we will consider a maximum of 6 people in our villa. The practical floor plan creates privacy between the bedrooms and the main living area. THIS IS A NON-SMOKING UNIT. WE DO NOT PERMIT SMOKING OF ANY KIND. Thank you! We diligently maintain our villa to ensure pleasant and comfortable accommodations for our guests. Our most recent updates include new living-room furniture, the complete remodeling of both bathrooms and new laminate flooring installed throughout the villa. We also offer free broadband wireless internet for your convenience!!! The living-room is equipped with a large, HD TV with DVD player and the master bedroom has an HD TV with DVD player. Our villa is truly home away from home! 117 Admirals Row is located in the MOST desireable oceanfront Building 'A' in HHB&T Resort with a lovely southern exposure. Our villa location is perfect for a great beach vacation. 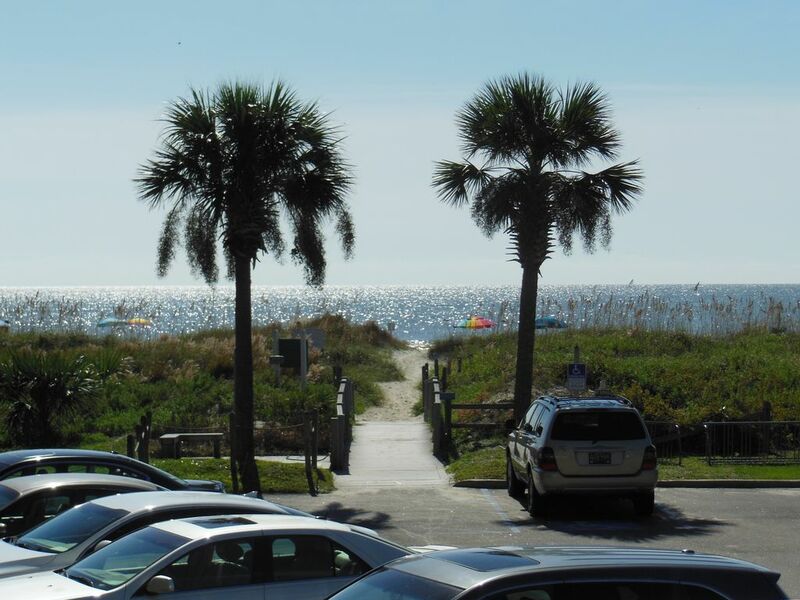 IT IS VERY RARE TO FIND A 2 BEDROOM/2 BATH RENTAL THIS CLOSE TO THE OCEAN! Our southern exposure offers warmth during winter months and cool shaded ocean breezes during the summer months. The ramp access from the parking lot directly to the front door makes our villa easily accessible and convenient. The corner location features extra windows for plenty of natural sunlight, extended views and comfortable ocean breezes. But best of all, our double balcony provides you with breathtaking views of the Atlantic Ocean - just 50 feet from your door! (see picture). Hilton Head Island Beach and Tennis Resort is a wonderful family-oriented oceanfront resort offering many amenities including ten lighted tennis courts (complimentary court time for guests), seasonal golf discounts on island courses (call resort for details), 2 pools including the largest pool on the island featuring 'Jamaica Joe'z seasonal poolside bar and grill, Coconutz Sportz Bar with karaoke every Tuesday and Thursday night, Gator's Pizza and Wings, bike rentals, fitness center, basketball court and seasonal children's activities at the pool. For more pictures of the Resort, go to their website . toilet, combination tub/shower, Newly remodeled in November 2013 - white and bright!